Since I first heard The Wolf, I thought that he was one of the hippest guitar players and singers! He understood how to comp behind other singers, whether it was Johnny Adams, Lee Dorsey, or Irma Thomas. I think “Doin’ The Funky Thing” is crucialchronic FUNK at its best! Walter “Wolfman” Washington & the Roadmasters have been doin’ the funky thing as long as there’s been a funky thing to do. In fact, when I asked George Clinton one time about how he got into the funk, he said, “There was this record on the radio: ‘Get Out of My Life Woman,’ and that was sure enough the funk.” Clinton was talking about Lee Dorsey, the bump and fender man from the 9th Ward in New Orleans, and Wolfman was his guitar player when Lee toured behind his hot single for Amy Records. 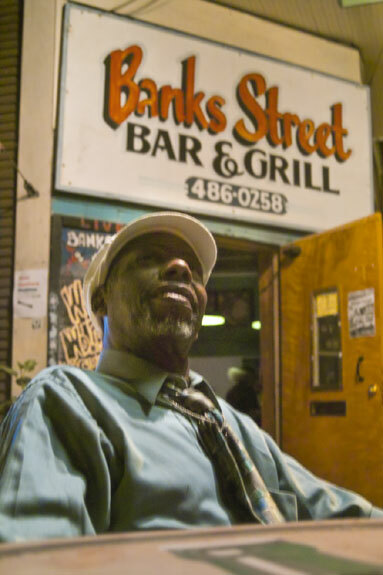 Wolfman is New Orleans to the bone, and in the tradition of hometown musical philosophers like Lee Dorsey, Professor Longhair, Earl King, Eddie Bo, Fats Domino, Jessie Hill and Wolf’s first cousin, Ernie K-Doe, he’s a deep thinker as well as a master musician. Wolfman started playing professionally in his teens, first as a member of K-Doe’s band and then as Lee Dorsey’s guitarist. He spent some time backing Irma Thomas and worked with David Lastie & A Taste of New Orleans before entering a 20-year musical partnership with the great Johnny Adams. Wolf always had his own idea of how he wanted a band to sound, and by the early 1980s he was recording sides for Senator Jones at J-B’s Records that established the high standard he would uphold and extend for the next quarter of a centurymusic that was deeply soulful, deliciously funky, tastefully lavished with horns and keys, but blues all the way down to the bottom and all the way up to the top. New Orleans blues, slick and urbane like always, and fully informed by the musical world outside the Crescent City. Wolfman’s stock in trade for years and years has been presenting and interpreting great songs by his blues musical contemporaries and role models, from Ray Charles and Little Willie John to Tyrone Davis and Bill Withers. But Wolf has always placed equal importance in his own compositions, and he’s continued to grow and develop as a songwriter rooted in the urban blues idiom. From his earliest recordings as a leader in the early 1980s, through his splendid Rounder albums Wolf Tracks (1986), Out of the Dark (1988) and Wolf at the Door (1991), his Point Blank CD Sada (1991), his Swiss recording with the J.B. Horns called Blue Moon Rising (1994), his return to Rounder for Funk Is in the House (1998) and On the Prowl (2000), his recent hiatus from recording and then rebuilding his life and his band after the Flood, to the crowning achievement of Doin’ the Funky Thing, his self-produced blues masterpiece, Walter “Wolfman” Washington has never strayed from his basic artistic identity as a soulful urban bluesman with creative vision who consistently delivers maximum excitement as a singer, guitarist and stage performer. Walter “Wolfman” Washington & the Roadmasters have already been leading the pack with respect to working blues outfits for a good 20 years now, and the tragic attrition of the ranks of their peers over this period has left the Roadmasters way out in front. But today as always, it’s the leader’s artistic conception and sheer determination to realize his vision that make his music shine and grow. 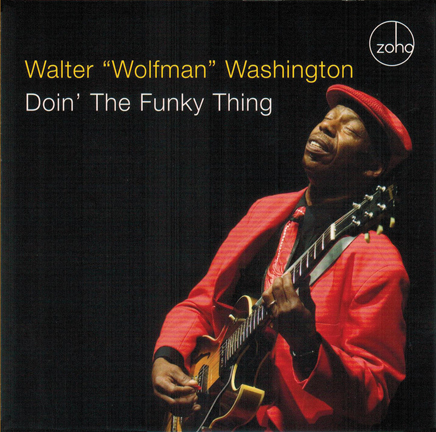 Doin’ The Funky Thing is an impressive and consistently moving achievement by an artist in the fullness of his maturity and a big step forward for the Wolfman as a contemporary blues composer. This program presents Wolf at his very best in every category: writing, arranging, singing, playing guitar and directing the band. He’s always bucked the economics and common sense of touring by carrying his own horn section at all times, and by now the horns whisper, punctuate, sing and shout like a natural extension of the Wolfman’s musical personality. Wolf’s song “I’m Back” is the central number in this collection of heartfelt sounds. While it may sound like a self-congratulatory title by some obscure singer who’s been off the set a while for one sad reason or another, in this case it’s not an artist’s belated return to commerce, but the on-going physical resuscitation and spiritual revival of the flooded city of New Orleans and its sorely battered citizens that’s at the core of this stunning suite of original compositions by the Wolfman. Lord knows where the Wolf had to flee to survive the Flood nor how long he had to stay there, but he got back to New Orleans as soon as he could and set about re-assembling his hand-tailored band, The Roadmasters, to perform and record the new songs he was creating to express the things he was feeling and seeing all around him. Wolf’s hopeful, emphatic vision of the city’s rebirth from the ruins is advanced in the core compositions in this set: “I’m Back,” “Landslide,” “Crescent City Starlight,” and the anthemic “Just Like That”, a song whichif soulful, swinging, intelligent music written with wisdom about real life issues and performed to perfection had any commercial value in the modern marketplacewould be shooting to the top of this week’s charts. Wolf’s fervent social pronouncements are balanced by more personal concerns in a smooth, reflective “One Day Being a Fool” and the exultant musical pledge of marital fidelity called “Only You”. And there’s plenty of Grade-A Wolfman funk like “Tweakin’,” “Wolf Jazz” and the two-part dance-floor marathon “Shake Your Booty/Funky Thing” highlighted by the Roadmasters and their leader’s fluid, effortlessly emotive guitar. Produced by Edward J Washington. Associate Producer:Barbara G Washington. Recorded and mixed by Tim Stambaugh. Mastered by David Farrell. Photography: Ericka Goldring (CD cover). Walter “Wolfman” Washington uses Gibson Guitars. Dr John appears courtesy of 429 Records (Savoy Label Group).